Observation - Pellets Tawny Owl/Kestrel ? - UK and Ireland. Description: Found at the base of a not too large tree. The pellets themselves are c20mm long, mainly compressed fur with very small shards of bone. Next to the pellets were two jaw/skull fragments, both around 20mm in size also. Found at the base of a not too large tree. 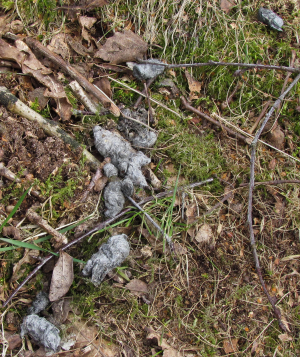 The pellets themselves are c20mm long, mainly compressed fur with very small shards of bone. Next to the pellets were two jaw/skull fragments, both around 20mm in size also.